Founded in 1891 by the Free Methodist Church of North America, Seattle Pacific University is an independent Christian university fully committed to engaging culture and changing the world by graduating people of competence and character, becoming people of wisdom, and modeling a grace-filled community. SPU students and faculty now represent more than 63 different Christian denominations. • Enrollment: The 3,813 students currently enrolled at Seattle Pacific originate from a total of 35 states and 43 foreign countries. 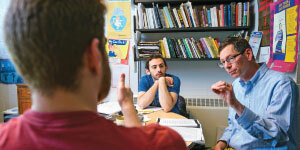 • Academics: SPU offers 69 majors and 55 minors. Find a complete list at spu.edu/majorsminors. • Class size: The average class size at Seattle Pacific is just 21 students, with an impressive 13:1 student-faculty ratio. • Scholarships and financial aid: Seattle Pacific awarded $110 million in scholarships and financial aid to qualified students in 2017–2018. • Learning outcomes: 97% of SPU graduates surveyed were employed or in graduate school within one year of graduation. • Location: SPU’s 43-acre campus is 10 minutes from downtown Seattle. The University also owns and operates a 965-acre wilderness campus and field station on Blakely Island and a 330-acre seaside campus and retreat facility on Whidbey Island. • Ready to apply? Learn more and apply online at spu.edu/apply. 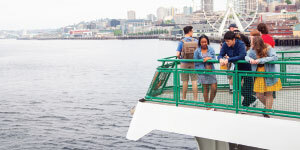 Welcome to Seattle, a global city brimming with opportunity. 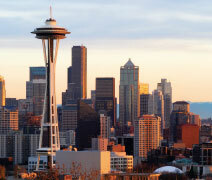 From this metropolitan hub, Seattle Pacific University equips students to join in. Our students grow in knowledge and skill, gain experience, and apply the Christian faith to prepare for their careers and engage the world’s deepest needs on local and global scales. The only private university in the Pacific Northwest named a “Best National University” by U.S. News & World Report, Seattle Pacific graduates students who are informed, skilled, and resilient—ready and able to change the world. A Christian faith perspective adds depth and purpose to SPU’s 69 majors and 55 minors, challenging you to think critically and serve with compassion. With an average of 21 students per class and a student-faculty ratio of 13:1, you’ll be encouraged and supported by faculty. The results are exciting. Seattle Pacific alumni serve and empower people throughout the city and world, and 97% of recent SPU graduates were employed or in graduate school within one year of graduation. Living and studying in metro Seattle’s beautiful Queen Anne neighborhood, Seattle Pacific students call the vibrant city of Seattle their campus. Numerous internship and work opportunities provide priceless real-world experience in organizations such as Amazon, Boeing, Google, Microsoft, Nordstrom, REI, and the Seattle Seahawks. Forty percent of our student body are students of color. Forty-one percent of our incoming freshmen are the first in their families to attend college. And our students come from 39 states and 43 countries. At SPU, diversity and multiculturalism are integral to our commitment to engaging the world and living out Christian faith. SPU’s Office of Multi-Ethnic Programs supports racial and ethnic identity development for all students through a variety of programs and events. Our campus has many multicultural clubs, and Seattle Pacific’s chief diversity officer leads campus-wide initiatives focused on diversity, equity, inclusion, and reconciliation. SPU is also home to the John Perkins Center for Reconciliation, Leadership Training, and Community Development, founded in partnership with renowned evangelical leader John Perkins. The tuition you pay at SPU is an investment in your future—and it’s more affordable than you think. In 2017–2018, we awarded $110 million in financial aid. For many students, their aid made the total cost of attending SPU less than enrollment at a public university. SPU also provides renewable scholarships for underrepresented students through Ames Scholarships. If you applied for Washington State’s College Bound program, you could receive full tuition—all four years—as a Falcon Bound scholar.